The fun is limited only by your children's imagination! Attach stickers, flowers, ribbons, balloons, glitter - anything you want! It can be a house, a theater, a store, a garage, a castle - your kids will use it a thousand different ways! This indoor playhouse is also easy to move outside on nice days. 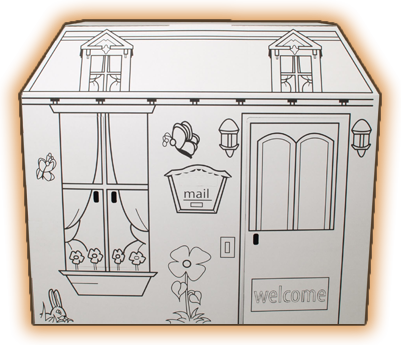 At Cardboard Playhouse, we would love to share in your experiences! Send us a photo and short story about your experience, and we will post it on the web for everyone to enjoy! Email your submissions here! Disclaimer: Please understand that at My Favorite Playhouse, we reserve the right to remove proper names and places from your submissions, as well as edit or use only portions of your submissions. By uploading photos, you are allowing My Favorite Playhouse to use your photograph in online formats.